Comments: Native to west Texas and the Edwards Plateau. 'Bubba' has dark green leaves and a large purple bloom. It also is more upright than standard Desert Willows. 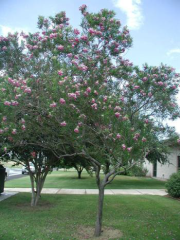 It is planted as an accent tree and remains a small ornamental. Can attain 20 feet tall x 20 feet wide. Culture: prefers well-drained soils of medium to coarse texture, full sun exposure. Withstands high heat and reflected sunlight off building glass and water features. Relatively low water requirement, but do not plant where water accumulates. Flowers in summer and fall.